Walt Disney World - Any picture you've taken at Disney World has also been taken by dozens, if not millions, of other tourists. A search for "Pleakley" on flickr.com is evidence of that fact. 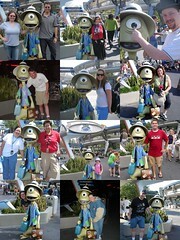 So I decided to put together a Flickr group named Pleakley In Tomorrowland commemorating our Pleakley picture. So far, there's 14 pictures in the group; not bad for a group with a ridiculously specific criterion for joining.